Ryan Gosling and Zach Shields met in 2005. Gosling was dating his Notebook costar Rachel McAdams, and Shields was dating her sister Kayleen. After discussing their mutual obsession with the Haunted Mansion ride at Disneyland, the two realized they shared a fascination with the supernatural. During childhood, Shield’s preoccupation with ghosts lead to his parents’ putting him in therapy, and Gosling once moved from a house believing it to be haunted. Their shared interest in ghosts, monsters, graveyards, and zombies sparked the idea of a theatrical ghost love story for the stage. Since a theatrical work is not complete without a soundtrack, the duo began songwriting and learning to play various instruments. Putting aside the scriptwriting aspect of the project, the two became more interested in creating the music. The two named themselves Dead Man’s Bones and soon thereafter released their first eponymous album. Although the album débuted in 2009, I first heard it only a few weeks ago. Honestly, it wouldn’t have appealed to me nearly as much had half the band not been the incredibly dreamy Ryan Gosling. To me—and to most other women—his voice possesses a distinct allure, and this carries through to his vocals on the album. Mr. Gosling isn’t just a pretty face with a charming smile; this isn’t just a celebrity pet-project. 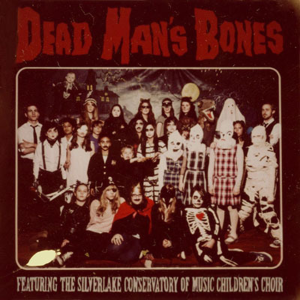 After I checked out Dead Man’s Bones, I quickly became obsessed with the haunting lyrics and sometimes-spooky melodies. Perhaps the most surprising aspect of the entire album is collaboration with the Silverlake Conservatory Children’s Choir, started by Red Hot Chili Peppers bassist “Flea.” Over the mellow wavering of Gosling’s voice, the children’s choir rises and falls in eerie innocence befitting an album whose songs were adapted from ghost stories. This album, along with hundreds more, is available for check-out at the Daviess County Public Library.